...but you can't take Texas out of the boy! Which is why J's moving back home after 4+ years of living in South Carolina. Since moving day is a little under a month away, we decided it was time to find an apartment. 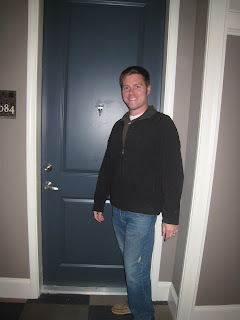 And find an apartment we did! We spent an entire day driving to and from apartment complexes, townhomes, and condos. I would NOT recommend doing this entirely in one day, but you gotta go what you gotta do! I'm swooning over this kitchen. And pretty soon, I actually get to cook in it. I've actually been leaving facebook comments to the kitchen on its picture on J's album. Every so often I stop by and tell it that I love it, and that I can't wait to make cookies in it soon. It's a little absurd. I'm pretty sure my own kitchen feels awfully jealous. 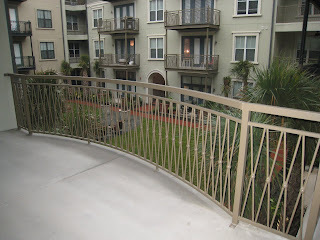 My love affair with the kitchen is nothing compared to J's love affair with this balcony. This picture doesn't even do it justice...that little courtyard is lovely, and there's a nice big area where we're going to put a table and chairs. J loves it. See how happy he is? It was a pretty successful apartment-hunting day! I CAN'T WAIT until J moves in after Christmas. I'm just dying to fill that cute little apartment with lots of cute little things! Anybody else feel a little too attached to your SO's house? 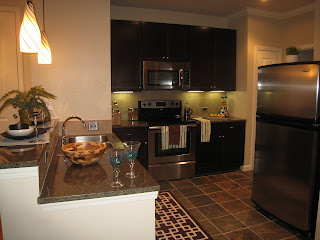 Do you have a special kind of love set aside just for your kitchen? I saw Pac Man today!!! Halloween Post. Better Late than Never!